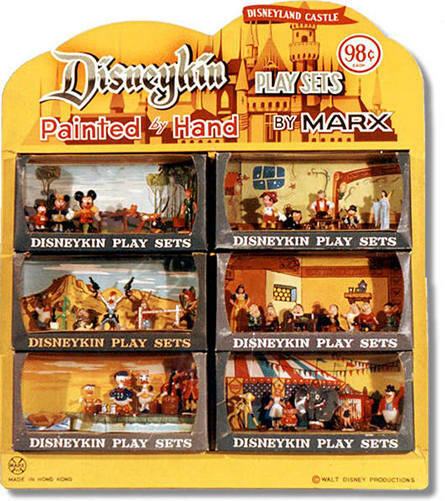 The six First Series Playsets are (clockwise from top left): "Mickey Mouse & Friends," "Gepetto's Shop," "Snow White & the Seven Dwarfs," "Dumbo's Circus," "Donald Duck & Friends," and "Panchito's Western Scene." The playsets retailed for 98 cents in 1961. Click on a First Series Playset to view a larger photo. Click on here to return to main First Series Disneykins page, or click Mickey icon.